Lets come to the famous Chips which caused a Chip in my finger and which caused me a chip on my shoulder!! There must be so many times when you see your 'Oh-My-God! Is it you...Its been Ages!' friends or aquaintance on the road or somewhere nearby and you feel that you should invite them to your place. And then bang comes the realisation that you barely have anything in your pantry or fridge ( except for some dish which U dint know was which day's left over!) or any snacks ( thanks to that ever lasting diet programme!) and giving some lame tea/juice is just not it! Hence some quick fixes help a great deal something which does not take immesurable length of time to make, something which you can make along side with your guest talking over your shoulder ( I know some ppl hate it! I know I do!!!) and its over in matter of minutes and is delicious to boot too...! I am talking about chips. What can be more easier than that! I made some vegetable chips y'day and which I half fried ( one batch) and half baked ( Since I couldnt fry with Red Ganga flowing off my finger tips for one hour straight!) and both tasted as delicious and as tasty as each other! ( dont worry - thats not blood covered chip! Its beetroot!!! ) Lets come to the famous Chips which caused a Chip in my finger and which caused me a chip on my shoulder!! There must be so many times when you see your 'Oh-My-God! Is it you...Its been Ages!' friends or aquaintance on the road or somewhere nearby and you feel that you should invite them to your place. And then bang comes the realisation that you barely have anything in your pantry or fridge ( except for some dish which U dint know was which day's left over!) or any snacks ( thanks to that ever lasting diet programme!) and giving some lame tea/juice is just not it! Hence some quick fixes help a great deal something which does not take immesurable length of time to make, something which you can make along side with your guest talking over your shoulder ( I know some ppl hate it! I know I do!!!) and its over in matter of minutes and is delicious to boot too...! I am talking about chips. What can be more easier than that! I made some vegetable chips y'day and which I half fried ( one batch) and half baked ( Since I couldnt fry with Red Ganga flowing off my finger tips for one hour straight!) and both tasted as delicious and as tasty as each other! Peel and slice the plantain in thin slices. Peel and slice the beetroot the same way. You can just cut thin slices with a peeler/knife. I peeled the Sweet potatoes and created ribbons with a peeler. Or you can use the Mandolin to slice all the veggies into thin slices. Fry them in batches, seperately in a oil - med-high. 5. Beetroot usually takes v less time and has to be done in high heat and taken out faster otherwise it would absorb lots of oil. Drain them in paper towels. You can bake them too at 450F for 10-20min depending on your oven. Season them as soon they come out hot. Hi, Does baking them (without oil) be healthier than fry? I also read about Terrachips but I am not sure how healthy they are. I am process of launching my organic product(s) soon but need to test them out and work on the process and business plans. Kale chips are great too as my kids and nieces introduced it me. I don't see kale chips in market yet..another great idea. 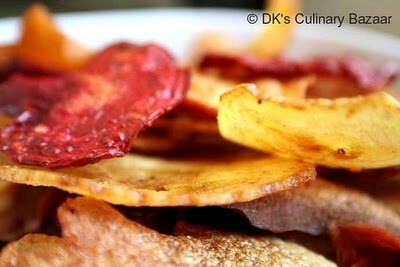 beetroot chips a very healthy option.would like to know wit other veggies too. The chips look ahoy! lovely chips. beetroot chips are quite innovative. Have a great weekend ahead. Hey - hope your finger is all okay now. I love your chips - they remind me of the Terra Chips that I used to love - and Beetroot was my favorite flavor too! hi dk ..these chips sure look delicious////nd crispy,..
divi..thats a helarious post..but sorry abt the cut..hope its better now! Chips looks so good :'). Good luck for the marathon,doing good DK. Hey u made a non- veg chips with finger leaking :) take care buddy! Lovely chips for marathon! the beetroot looks soooo red. hey DK i hope ur fingers alright now!! !the chips are looking really crispy and delicious!! !